Bluegrass Pundit: Did Hillary Clinton lie under oath about Benghazi security request when testifying before Congress? 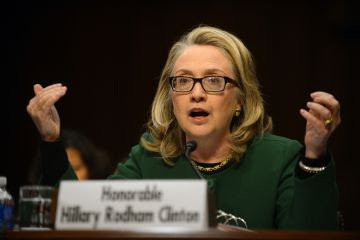 Did Hillary Clinton lie under oath about Benghazi security request when testifying before Congress? And "What difference does it make?" House Republicans released their report on the investigation into the Benghazi terrorist attack, having concluded that then-Secretary of State Hillary Clinton was not telling the truth when she told Congress that she wasn’t aware that officials at the U.S. mission in Benghazi had requested extra security. The House report suggests that Clinton received a request for more security from Gene Cretz, who preceded Christopher Stevens as ambassador to Libya. “On April 19, 2012, the response cable from the Department of State to Embassy Tripoli, bearing Secretary Clinton’s signature, acknowledges Ambassador Cretz’s request for additional security but instead articulates a plan to scale back security assets for the U.S. Mission in Libya, including the Benghazi Mission,” the House report says. Lyinng under oath? Is Hillary keeping up the family tradition?